Hello students, and parents! Please take a look at this exciting opportunity to receive additional academic support through Revolution Prep! Please click on the headline to see more! Thank you! Hello AUSD students and families! 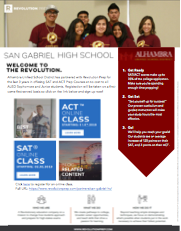 As you know, Alhambra Unified School District has once again partnered with Revolution Prep for the 2018-2019 school year to offer SAT and ACT Group Courses open to AUSD students. If you missed your chance last semester or simply want to take the class again, please open the attached flyer for information on how to sign up! For the Spring semester, classes will be offered online. This means you can pick a schedule that is most convenient for you and won’t conflict with your other activities. The online classes can be launched from anywhere (home, school, library) -- all you will need is internet access and a computer! Sign-ups are now open. Please note: Priority will be given to 11th grade (Juniors) followed by 10th grade (Sophomores); however, all Juniors and Sophomores are encouraged to register. All students that wish to participate must complete this registration form to reserve your spot! Registration will be filled on a first-come, first-served basis. Click the link on the flyer to see all of the times classes are available.